If that happens to you, it’s time to break out the first search command every Wave newbie needs to know: with:public, which returns a huge moving sea of public waves anyone can read and update. There you can dive in, meet other wavers, see what’s possible with Wave, and ask how to do stuff. Wave documentation is building up fast and furious inside Wave, and since everyone’s new to it, everyone is asking questions and lending each other a hand. Once you’re tired of your inbox crawling with public waves? 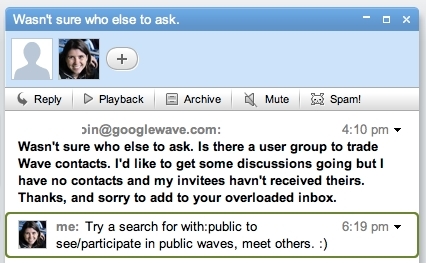 Save a search for waves just to you by using the in:inbox to:you@googlewave.com to pare down your list. Thank you for this. I’ve been trying to figure out what to do with wave when none of my contacts are on it. Would love to connect, but I have no invite. What I would like to know is if the reliability has improved over the Sandbox version released before or if this is the same version. Thank you so much! I was wondering how to go and find people. Wave needs a cheat sheet of this kind of stuff. excellent! finally able to wave with people while the invites start rolling out. Thanks again Gina, it was overwhelming at first but I think I’m starting to get a handle of this. Reminds me of how I felt when I first started using Twitter well over a year ago. 🙂 Let’s be sure to connect with one another (Smarterware readers). Cheers! Could you send me an invitation? You will make me so happy and I would be really grateful! That was exactly my experience, too! Until someone told me about with:public, I thought wave was terribly overhyped. Now, I’m thinking of doing development. You can also add public@a.gwave.com to your contact list to be able to start a public wave yourself. Wow! Public is overwhelming at first. How do I find Wavers in Orange County, California? Interesting to see Waves from around the world. Wondering how to apply this to real estate. Lots to learn!